A nicely designed, highly configurable interface ready to have almost any sound source thrown at it. Highly configurable, with multiple input and output sources. Three contemporary colour schemes to choose from. First announced back in January 2015, AudioFuse is an attractive and portable Mac, PC and iOS-compatible interface with a raft of features. So how will AudioFuse vie for your attention in an already crowded marketplace? AudioFuse is available in three different colour configurations: Deep Black (black lid, orange surround with lime green trim), Space Grey (white leather and dark grey aluminium) or Classic Silver (a lighter grey aluminium with brown leather surround). It’s good-looking, and the lid doubles as a base support when AudioFuse is in use. Despite the compact frame, there’s plenty of connectivity on offer. Along the front edge, you’ll find combi inputs and two fully independent headphone feeds. In turn, these can accommodate both mini-jack and 1/4" plugs. At the back, there are speaker outputs for two pairs of monitors, line level connectors, MIDI In/Out ports (which, due to size restrictions, have been replaced by mini-jack connectors, which you’ll find in the box) and - for digital interfacing - both S/P-DIF and ADAT In/Out. There are also inserts for inputs 1 and 2, allowing you to track through hardware compressors or channel strips. 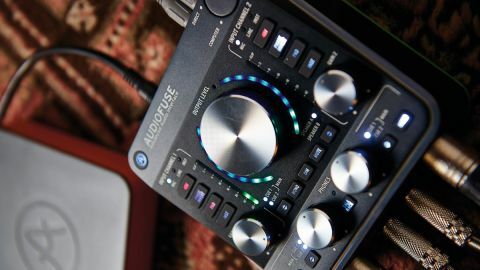 AudioFuse connects via USB-2, but USB connectivity goes further; Arturia have built a USB hub into it, providing three extra USB ports. AudioFuse is a plug-and-play interface which requires no dedicated driver, but it’s well worth downloading the Control Center software, which acts as a bridge between the interface and your chosen DAW. The software mirrors the upper panel display of the hardware, whilst also laying out additional functions. The input selection dropdown within your DAW will show you how AudioFuse’s inputs are arranged; 1-2 are mic/line inputs (which use Arturia’s own excellent sounding DiscretePro preamps), 3-4 record via the rear phono or line level ports, 5-6 allow access to the inbuilt talkback microphone, whilst 7-8 use the S/PDIF digital inputs. If you’re making microphone recordings, key settings (48V Phantom Power, Pad, Phase Invert etc) can be configured from the twin upper-panel input strips (or can be configured over software), whilst the central, largest silver dial controls output volume and can access two separate pairs of monitors. Within the software, you can readily control all inputs/outputs, configure Cue Mixers for recording, and oversee settings including Clock Rates. Our only concern with AudioFuse is its price; other interfaces with similar levels of I/O are available for substantially less. Otherwise, there’s no doubt that AudioFuse provides a beautiful and contemporary approach to audio interfacing with a great design, compatibility with a huge range of possible audio sources, a great sound and a highly tactile control set.